She has refused for fear of what my plans are for the piece. Am I ashamed of the work? Heck no, it's a great painting! It's also a 180 degrees different style of work that I do today. So yes, it would go into storage to be used as a teaching aid only. Do I regret doing this style of work? Again, heck no! Each step in this journey has taught me things, and using Bob Ross painting techniques, and Bill Alexander painting methods have helped me to understand how the paint handles when there is a lubricant, or wet undercoating. It also showed me a little about dry brush mop blending. Back then Bill called this "hypnotizing" the paint. 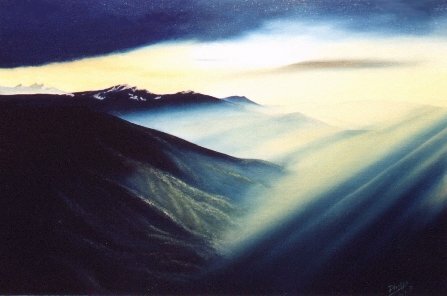 One of my early Bob Ross painting examples. Some also refer to it as "setting the paint". I discuss this throughout the "free lessons" portions of the site in detail. It is where you take a dry mop brush, and gently stroke the paint on the canvas to soften all edges and blend away brush strokes. My techniques have changed as the years have gone by. Would you like to learn more about them? 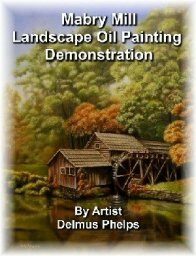 You can check out my landscape painting demonstration here. It opens in a new window so you won't lose your place here. Let's talk a little about the materials needed. The oil painting technique is centered around one main ingredient. "Magic White". This is a thinned down white paint that is applied directly to the canvas as a thin coat. The magic white is usually applied with a 2-1/2" broad, pure boar split bristle brush. It is not allowed to dry during the paint session, paint is applied in this wet coating. When other colors are added, it helps with their blending and creates variations in color and intensity. The magic white is also used like any other white paint when mixed with colors, it will lighten them. Brushes also include the 1" pure boar split bristles. Fan brushes, flats, and liners sizes varying to your taste. Also used extensively in the technique is a special shaped palette knife. 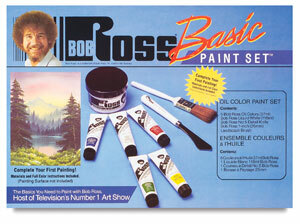 Below is a very basic set with some, but not all the things you will need if you want to pursue this style of painting. We've all seen the video's, Bob Ross and Bill Alexander have both had a long running series of PBS shows showing the technique. Painting is done Alla prima onto the coating of wet magic white. 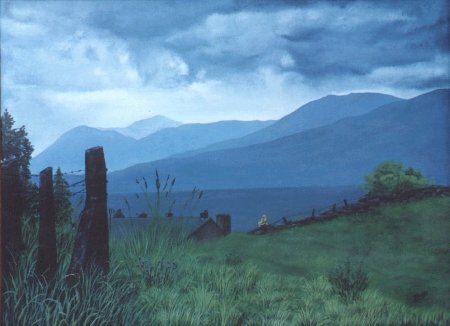 Paint is applied in multiple fashions usually starting with a large brush for background skies and mountains, blended (hypnotized). The mountains, trees, water features and added and blended. Finally, details are scumpled in with the knife or liner brushes. These are usually not blended to allow the impasto effects to remain. Now, I know some of you are scoffing at the technique. My objections to the technique are only concerned over the longevity of the work produced. We know from works in the past that used excessively thick impasto passages have cracked and chunks of your painting are found on the floor! But this usually takes a number of years (50 plus) to manifest itself. So, from a learning point of view, it is an excellent teaching method to help you understand manipulation of the paint on the canvas, blending of paint wet-in-wet, and dry brush blending (hypnotizing). If you are mindful of the thickness of your paint applications, why not give it a try! Want to get out of training wheels and paint like a pro? Click Me to kick off those training wheels!